I am a Smiley360 member and not too long ago I received an opportunity to join in on a VitaFusion Simply Good Vitamin mission. 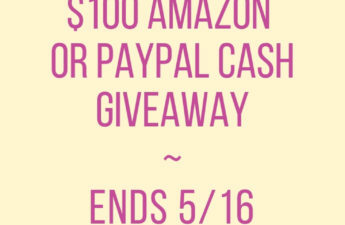 I was sent 2 full size products, Simply Good Vitamin B-12 and Simply Good Multivitamin for free for my use and review. 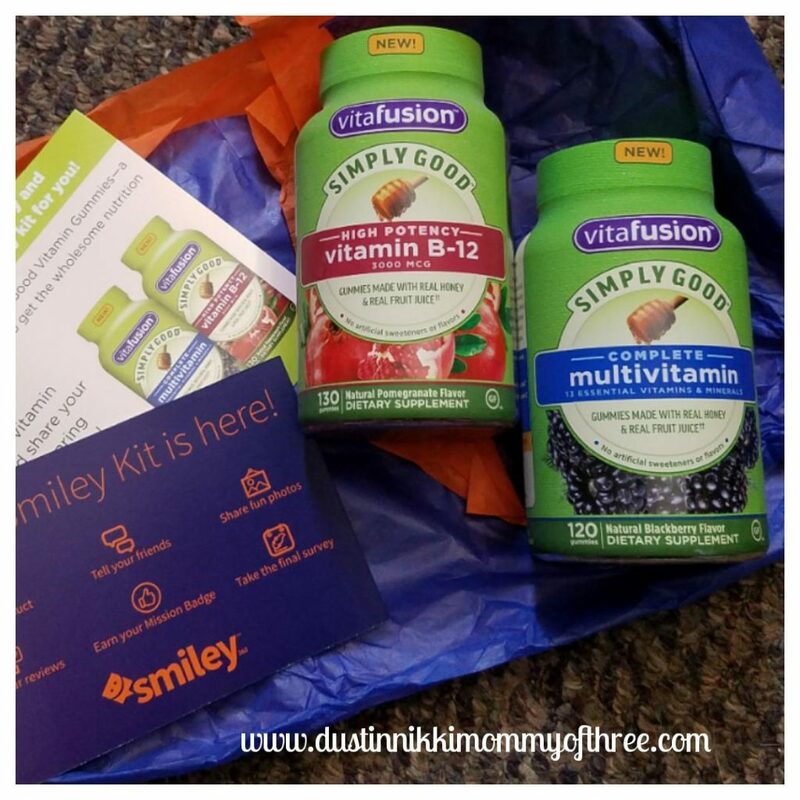 I love VitaFusion products and was really excited to give these new vitamin products a try. The VitaFusion Simply Good Vitamin B-12 is for red blood cell formulation and it is also for nervous system health support. Like VitaFusion’s other vitamins, these support energy production by converting food into fuel. These are made with real honey and real fruit juice, no artificial sweeteners or flavors and has a natural Pomegranate flavor. The flavor of these gummies is really awesome. 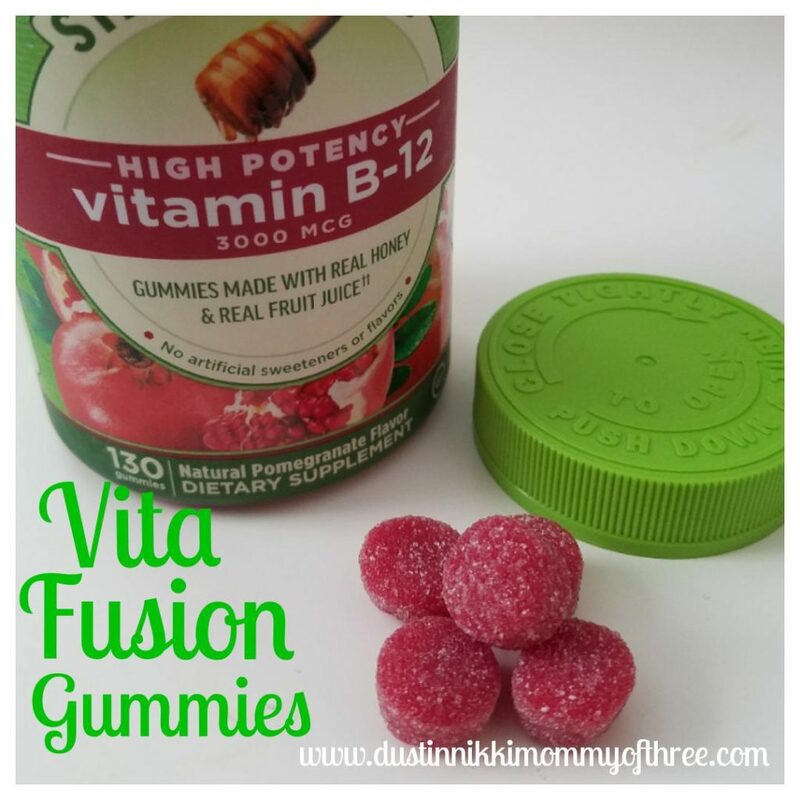 They aren’t sweet and like VitaFusion’s other vitamins, these taste like the real thing. They are really soft and easy to chew. I love the texture. These vitamins provide a lot of Vitamin B-12 so if you are looking to add more to your diet, here you go! 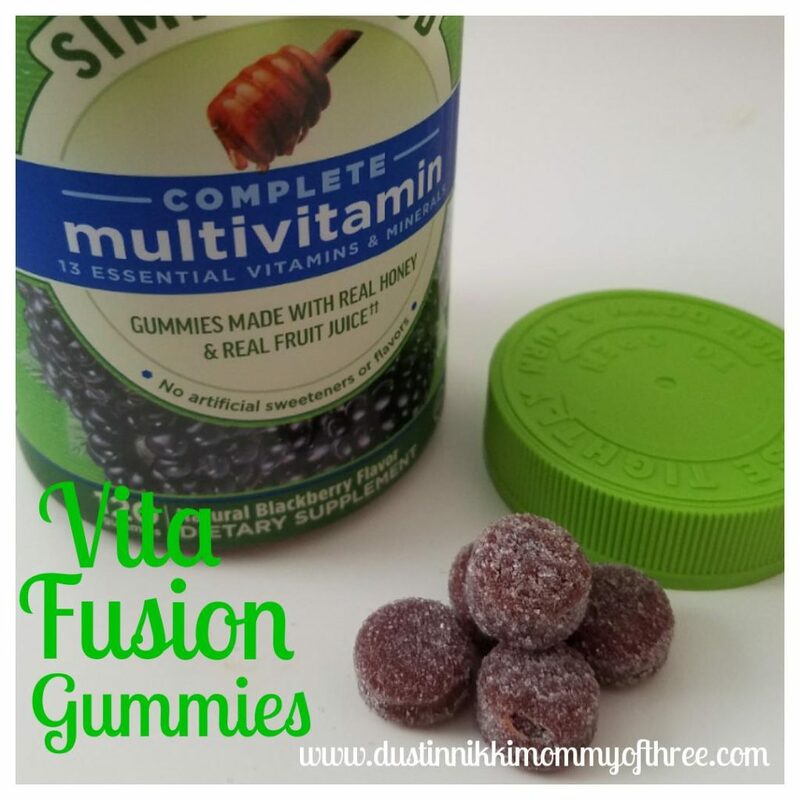 Next we have the VitaFusion Simply Good Complete Multivitamin gummies. These gummies are packed with vitamins. You have Vitamin A, C, D, E, B-6, B-12 and more. 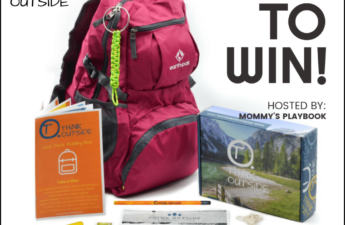 Check out their website for more information about this product. I am not one who eats a lot of vegetables. I know, I know. Shame on me especially when I make my kids eat them. This product contains as much Vitamin A and C that is in 3 cups of spinach. The B vitamins to turn food into fuel and of course Vitamin D for immune system support. Again, the flavor is really good. They taste a lot like blackberries. They aren’t tart like blackberries can be though. I remember when we were kids, my grandma had a few blackberry bushes and we would go out and pick some and then sprinkle a little sugar over them. That’s what these tasted like. Like blackberries with just a little sugary sweetness to them. Like the previous product, these are made with real honey and real fruit juice and they have a natural Blackberry Flavor. Since the multivitamin has a good amount of Vitamin B-12, I stopped taking the B-12 regularly while taking the Multivitamin. 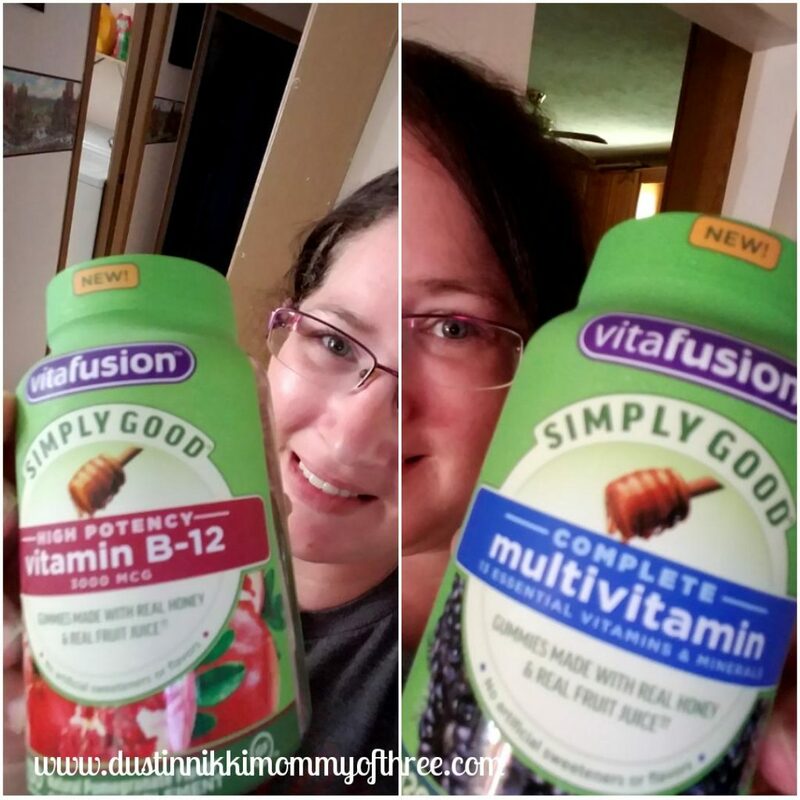 I have been taking another multivitamin brand regularly but switched when I tried the VitaFusion. After taking only these vitamins the past couple weeks, I think I might stick with them. So if you are looking for a good multivitamin, check out VitaFusion’s website and check out their products and see if they are a fit for you. NOTE (This is for BOTH the above products): *These statements have not been evaluated by the Food and Drug Administration. This product is not intended to diagnose, treat, cure, or prevent any disease. Buy It: Check out VitaFusion website for more information about their products and where to purchase them. Disclaimer: I was not compensated for this post. 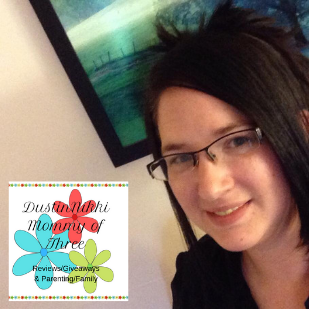 However, I received free product(s) mentioned in my review post for my use and review. All opinions are 100% my own.